Olentangy Liberty’s Abby Erickson (24) and Claranne Fechter jump to try and block a shot from Big Walnut’s Caroline Speelman during Tuesday’s non-league showdown in Sunbury. Olentangy Liberty girls volleyball coach Jen Chapman had a smile stuck to her face for most of Tuesday night’s non-league victory at Big Walnut in Sunbury. She has reason to smile, too. Her Patriots (12-0) kept their undefeated season going with a 26-24, 25-21, 25-19 win over host BW. The Eagles came back from a 24-19 deficit to tie it 24-24 in the first set – getting key points by Mac Podraza and Caroline Speelman as well as a combo block by Speelman and Kaley Rammelsberg along the way. 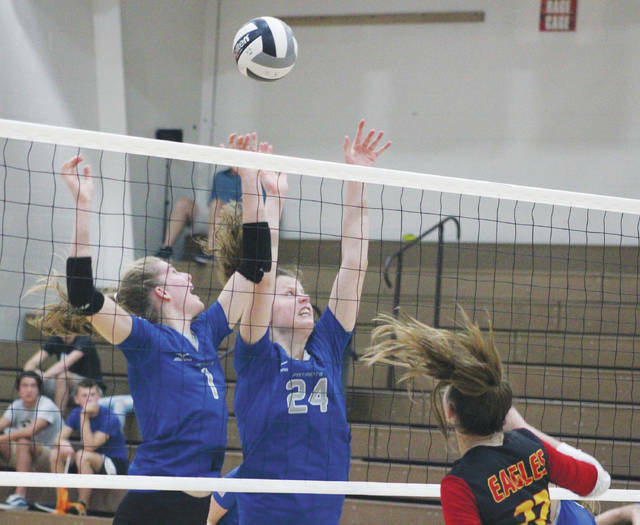 But, the Patriots got a Taylor Karlo tip shot to break the tie and Maile Steckelburg and Sydney Novy each went to the ground to keep the ball alive for a Claranne Fechter set-clinching kill off a Logan Flaugh feed. Liberty went on to finish the sweep to extend its winning streak to open the season. The Patriots used solid defense to frustrate BW, which had an eight-game winning streak snapped. Steckelberg had 28 digs to lead Liberty, which finished with 71 as a team. Karlo had 12 kills and Fechter finished with 11. Karlo had seven and Fechter had six in the first set alone. Flaugh finished with 34 assists and a pair of aces to lead the Patriots. Steckelberg also finished with a pair of aces. All helping Chapman keep her smile. Podraza had 10 kills to lead the Eagles (9-4), Kelsie Imertreijs finished with nine and Caroline Speelman added seven. BW, a Division II state finalist last season, has run the gauntlet in its non-league schedule. Liberty is the sixth Division I opponent on its non-league schedule with two more left to play. The Eagles are 4-3 in those games. The Eagles have also faced other D-II powers such as Marengo Highland and Granville, which they split. Lehman believes this will help them come tournament time. Both teams return to league action Thursday. BW hosts Franklin Heights in OCC-Capital play at 7 p.m. and Liberty visits Westerville Central in OCC-Buckeye action at 6:30 p.m.